It's been beastly hot lately, so here is a quick and easy meal that's delicious and - more importantly - will not turn your kitchen into a sauna! 1. Place couscous in a large bowl. 2. Heat orange juice and water to boiling and lightly salt. 3. Pour over couscous and cover tightly with plastic wrap, letting it sit for 5 minutes. 4. While couscous is cooking, slice cucumbers, chop olives and chiffonade herbs. 5. Mix cukes, olives and herbs in with yogurt, and season with salt and pepper. 6. 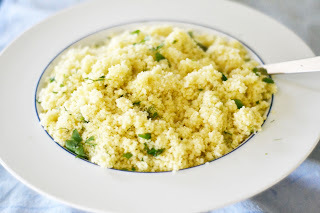 After 5 minutes, taste couscous. If it seems underdone and if there is a lot of liquid left in the bowl, allow it to sit for a few more minutes. 7. When couscous is cooked and has absorbed the liquid, add in smoked paprika and olive oil and season to taste. 8. Grab bowls, dish out the couscous and top with yogurt mixture. For maximum refreshment, slice up a lemon and throw it in your water glass with some more fresh mint and head to the porch or stoop to relax and enjoy.